A non-narrative cyclical work exploring issues of queer identity, money, power, politics and desire. Lust was Pacitti’s first full public performance work, made whilst in his second year of art school. Performed on a small stage in The Marlborough Theatre (decades before it became the theatre it is today) the work used a slide and overhead projections onto a projection screen made from newspapers, and a large web installation of the plastic rings that hold four-packs of beer together. A recorded soundtrack played original material by Pacitti, as well as work by Test Department, Bauhaus, Purcell, and Elgar. 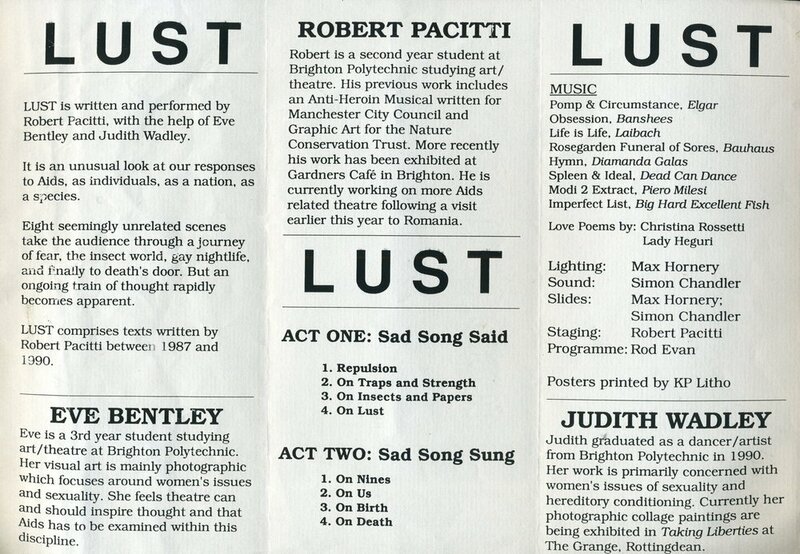 Lust was co-produced by Aids Positive Underground Theatre Company (APUT). The project was funded by South East Arts and was performed for 3 nights at The Marlborough Theatre in Brighton. No known video documentation exists of this performance and the images are all that remain of this early work.